Ulbus – Warhound of Bethseba from Thistle. Thistle’s latest, based on the new “Nurgle lord” clamp pack model everyone is going to convert. The tribarrel gun and the rare blue hues really make this model for me. That’s awesome. Nightmarish in appearance and proportions. I’m working on a project of my own using the Slaughterpriest, and I was thinking the other day that this figure is destined to be the next to inspire countless conversions in the same way that the Lord of Nurgle figure has. Yes. I’m holding off because everyone else is already on it. But eventually I will give up and do mine and it’ll be fun to try be unique when everyone has already made one. I really love what Thistle did with his. It is great to see more and more people using the slaughter priest for conversions. I think this is one of the strongest i have seen. The few careful changes really make it a different model. The talos arm works so well here, I am amazed (the slaughter priest sure is big!). My favorite part is the tribarreled pistol though. The grey-blue tones to his skin look rad too! The contrast between the fiery orange and the cool blue of his skin is just lovely. That is right on the money – great base model and a lovely conversion… the painting is sublime. Instant classic! The blue hues really caught my eye. This will be a strong inspiration for my own warband’s feeling! That Slaughterpriest is a gorgeous model, a worthy successor to the Nurgle Lord as the ‘model the whole world and its dog have converted’. Secretly I hope that just as the popularity of the Nurgle Lord led us to the Blightkings so the Slaughterpriest might spawn its own box set in a few years time. Ah well, a man can dream. In the meantime, excellent work again Thistle – as others have said the blue skin is spot on (to my eye it almost looks like his whole body is covered in fading tattoos) and the helmet is a nice choice and really compliments the model. His mistresse, whom he follows without question and adores as a savage dog does his owner… a terror to enemies and strangers, fawning and affectionate to his mistress. His hands have been cut off and replaced by rather crudely implanted weapons… perhaps sustained by an ichor piped into him. A twisted giant of malformed flesh and crudely fused machinery… the claw-implant in particular looks agonisingly painful, a mass of brass and iron crudely bolted to his bones and sewn to his nerves by a fleshe-artiste… of course the pain will increase his savagery, like a wounded beast. His face a sinister mask of goggled eyes covering some twisted nightmare. The skin is pallid, necrotic, the grey-blue tone suggesting a sort of jaundice or discolouration caused by drugs or genetic aberration. Notice also his collar of fur, even fouller than usual (a thick browny-red wash indicating all manner of nastiness), I imagine slick with blood, greasy, unwashed, crawling with lice, an odd note of aristocracy, perhaps the Ladie Betseba wants her servants to reflecte a little of her ”glory” like the old footman’s livery. Hence the knightlie spiked greaves as well, which are actually very well made (I imagine it takes considerable skill to create the flexible foot-joint from metal plates… they look like they once formed part of some noble suit, rusted and filthy, found in some hoard of technologie and metall and taken to outfit the ladie’s twisted knight-errant, or else an heirloome of house betseba long decayed in low terra. It’s a true honour, Mr Laurence/Thistle/Ioannes Albus. The stroke may, if I may say so, have robbed you of your capacity with wordes but your paintinges telle tales of squalor, paine, pietie and glorie which I will never equal… my verie beste to you. I thinke you’re right, your condition allowes you to see within the grim, grimy worlde of the fortie-first millennium which will be your everlasting remembrance..
And everybody thought they were rebreathers but in reality they are nose gays ……. Not herbs but sweat meats …. Shudder… I now tend to imagine when the masks are removed, the faces are smeared in blood, snuffling noses, mucus, blood and bits of flesh. I’m sure the blue skin treatment is fantastic, but the post-processing on that photo has destroyed it by adding its own artefacts – I’d love to see what these minis would really look like, via a decent camera and lens and not an iPad mini. Does Pilgrym need a photographer? I did make a special trip to Nottre Ham a few years ago to shoot some of Alan’s collection in his games room, they made it onto the front cover of Miniature Wargames. Same with Gripping Beast. I would be happy to do the same for Pilgrym, not for commercial reasons but just out of pure admiration for what you are doing. I can’t promise the lofty technical standards of ‘the firm’, but the offer’s there if you ever need it. I shall muse and let you know …. What a beast! I was hoping to see more pictures of this after seeing a teaser of it in the box. The blue skin is beautiful; So unlike anything else I’ve seen you do, but no less interesting for it. 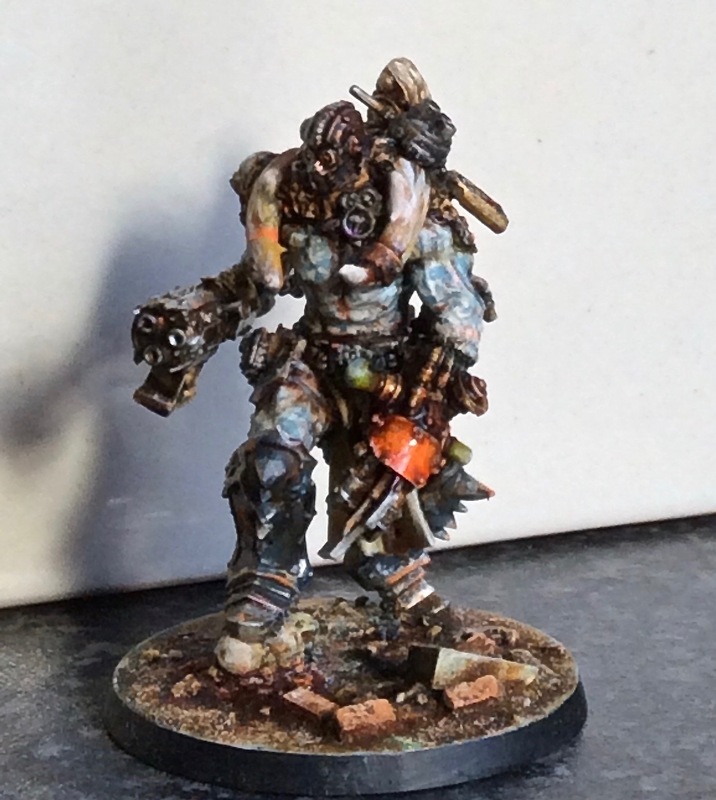 Migs – How about after the Pilgrim we all have fun making and painting an Ork? Total change of pace. Even better, an Ork week mid-pilgrym to shake things up. For those who are interested of course.. Excellent! Brutal and beautiful. Wish I could paint like that. As you guys say, the slaughterpriest is the next big thing..
What is the plan for this guy in the pilgrym project? Ulbus is a perfect name, it makes me think of ulv (wolf). The blue tones makes me think of celts. all of it together turns him in to cuchulain, the great guard-dog-man. which, again, fits what Ulbus is perfectly. Also, the touch of orange against the blue skin is fantastic!